The Trapp Family Lodge is one of my all-time favorite engagement session locations. If you're looking for a location with a musical and historical back story, the Lodge is perfect for you. The Trapp Family Lodge was founded by the von Trapp family (of Sound of Music fame). The family settled in Stowe, Vermont after touring across the U.S. because the vistas were reminiscent of their home in Austria. Brandon and Natalie's 2017 wedding at Trapp Family Lodge showcases these mountains and beautiful Stowe backdrops that the von Trapp family originally fell in love with. From these photos and the photo pictured above, you can see that the grounds offer many different locations to take stunning photos. There is a beautiful and romantic garden and a number of meadows to frolic in with the love of your life. 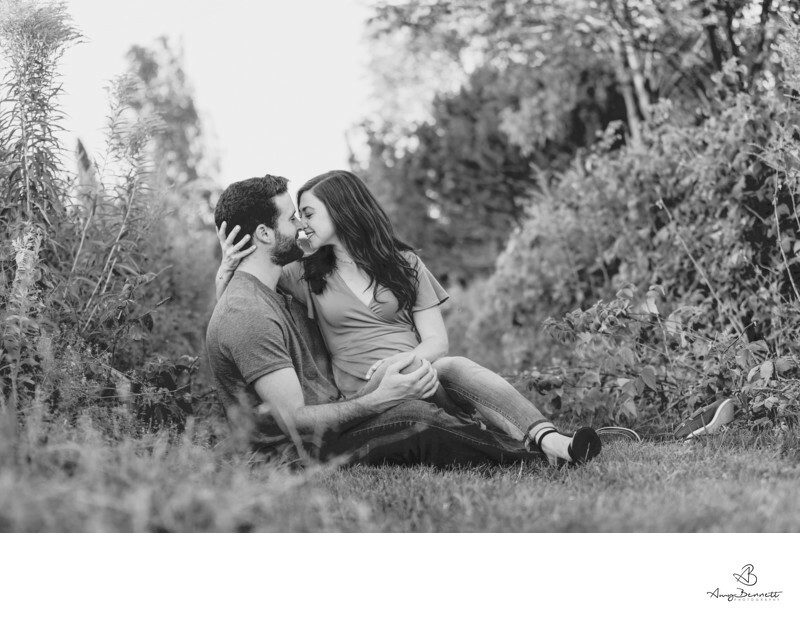 The warmth and color at this location allows for intimate moments like the one pictured above to occur naturally. Intimate portraits are often best showcased in black and white, but the Trapp Family Lodge has no shortage of color, especially in the summer and fall months. They also boast a variety of gorgeous indoor options for wedding ceremonies and receptions for chilly Vermont winter weddings. Don't worry, we'll still get outside to take portraits with the gorgeous snow-covered mountains as a backdrop! Click here for information on Trapp Family Lodge weddings.